The International Diploma is our alternative applied learning pathway for those students for whom the IBCP is not suitable. Such students may be suited to applied learning but are not yet ready to specialise in the way that the IBCP requires. These programmes are rigorous two-year courses designed for students who prefer a more practical and professional approach to their learning. Students are continually assessed through a combination (dependant on programme) of case studies, practical applications, presentation and portfolios. Each student will normally choose one major subject (BTEC Level 3 Diploma) and one minor subject (BTEC Level 3 Subsidiary Diploma). Students can also take complementary subjects as IB Subject Courses (previously known as ‘certificates’) and the Edexcel Extended Project Qualification. Students will also have to fulfil creativity, action and service requirements, take part in the school sports and leisure programmes and undertake various work placements. Please note that the combinations of BTEC courses that we offer, one major and one minor, does not lead to the Extended Diploma. The Extended Diploma comprises of 18 units from the same subject, as with our Engineering Pathway only. 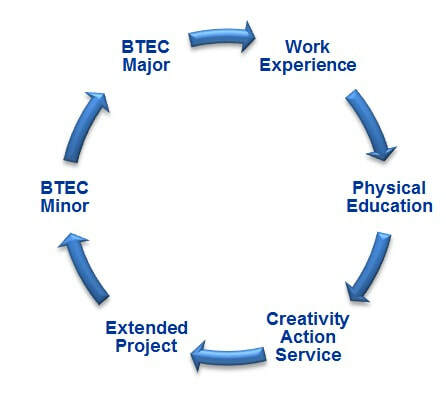 ID Pathway: What is BTEC? International Diploma students will be rigorously assessed, internally. Students will have the opportunity to major in a specific area and study a minor subject which will gain them an equivalent value of 3 UK A-levels. All students will undertake a suitable period of work placement during their two years. They can also choose to study up to two IB courses and an optional Extended Project. The Extended Project is an opportunity for students to choose a topic to explore or develop, honing presentation and research skills along the way. The topic chosen must complement and develop themes related to the student’s Major subject area or it must support progression in terms of future employment or study. The project can be presented in one of 2 of ways listed below. Artefact – for example, making a painting or sculpture, designing a piece of furniture or a garment, creating a website, solving an engineering / construction problem, producing a piece of graphic design. Whilst the Project is internally assessed, all projects must be verified by staff from the external awarding body. If you feel that the above subject choices are not appropriate for you on your vocational learning journey then you may wish to view the Post 16 Handbooks of the other ESF Secondary Schools as there is a variety of subjects on offer. For further information about BTECs, see the individual subject pages above, or under the careers-programme link.